Our first clutch of the season has been laid, and while it isn’t quite the news we were hoping to have, some good news is better than nothing but bad news! Our het Lavender Albino, Mrs. Bucket, laid on February 1st, from our Lavender Albino, Buttercup. 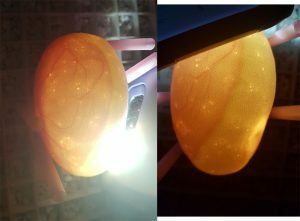 Unfortunately, we only got one egg out of it, and the reason we’ve taken some time before announcing it is that we wanted to make sure the egg was viable enough to make it through the first week, because it only has half veins. While it is a little disappointing, we’re still very happy to have even one egg! Mrs. Bucket is 7 years old, and this was her fourth year being paired, however this was the first year she has actually conceived. Buttercup is a proven breeder (and a very good one at that! We always see so many locks from him!) so we knew Mrs. Bucket was the one having troubles. We started breeding them a few months earlier this year to see if it made a difference, and it did! Mrs. Bucket’s pregnancy wasn’t smooth, so only getting one viable egg wasn’t a huge surprise. She had already passed approximately 5 teeny tiny slugs on two occasions before her due date (two immediately after her pre-lay shed, and another three a couple weeks later) and she laid 2 days early. She ended up laying 1 egg and 8 slugs on February 1st, so had the pregnancy gone well, we’d have had a whopping 14 egg clutch! It’s not uncommon for first clutches to have some slugs, so fingers crossed that next year, we will have better luck. The egg is now over a week old and looking fine. We know there’s still no guarantee it will make it to term, but we remain hopeful! !